Multi-Perspective Palm Reading has entered now the field of psychology as well! In (academic) personality psychology is the trait of 'Extraversion - Introversion' being recognized as a key-dimension in the field of personality psychology. But the term 'extraversion' became also became a popular feature in daily life to describe the personality of an individual. 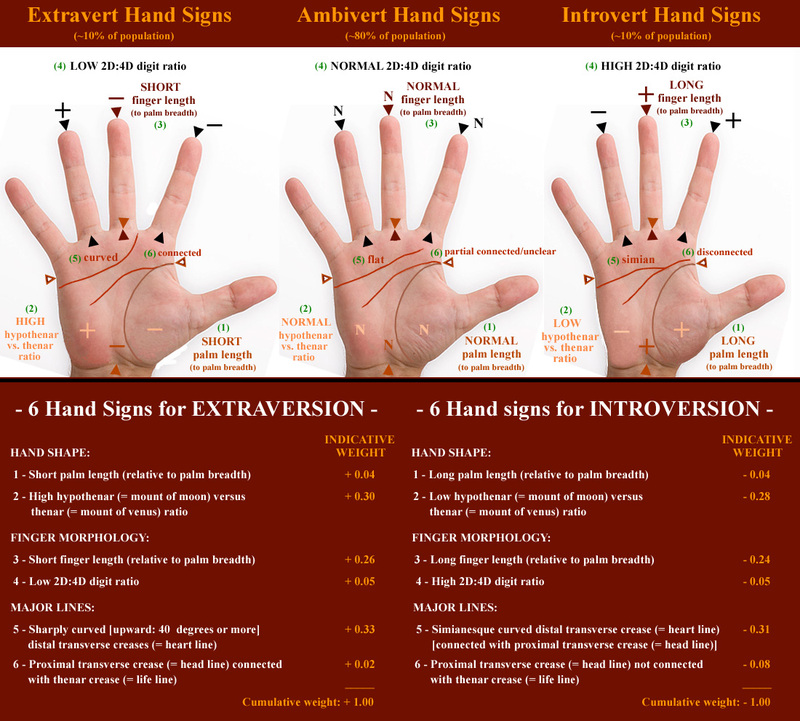 This article presents a brand new model for recognizing the hand of an 'extravert' (= a person who scores high for the Big Five personality dimension 'extraversion') via 13 6 aspects of the hand (related to three hand dimensons). The article e.g. also presents an overview of guidelines that have been presented by various hand reading authors (including: Arnold Holtzman, Johnny Fincham & Nathaniel Altman) for assessing extraversion/introversion via the hand. NOTICE: I would advice to ignore the far less detailed results (for the female sample only) reported in this preceeding article. Hmmm ... ... I just tallied up my scores for both sides and seem to come out as extrovert (total score of 2.2). Maybe I made a mistake - MBTI type tests all put me squarely into the introvert box, and that's also what my self-understanding is. Has anyone else here added up their score? hi kiwi, I haven't added up my score, still studying the picture & info. How about point # 8, related to joining of head and life line? 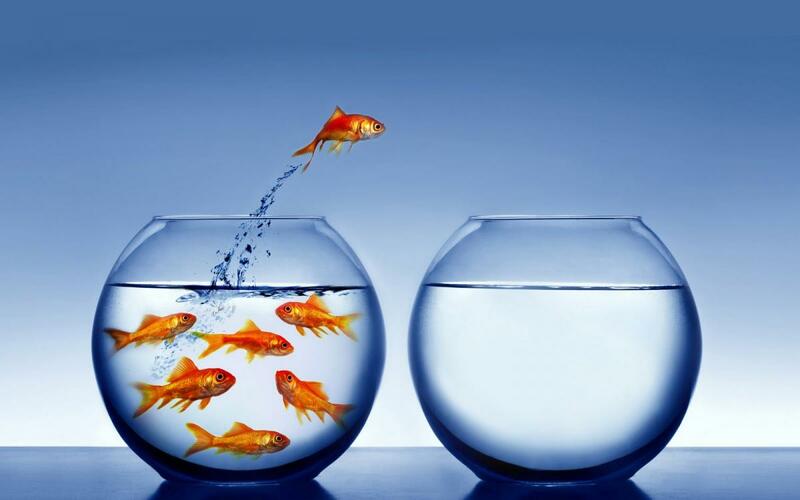 The model says - if they are joined then it shows extroversion and vice-versa. Very interesting dude Matrtijn. Life line and head line joined, Developed mount of moon are signs of extrovert. You always come with interesting funny items. Keep it up and enlighten all palmists. EXTRAVERT: '...... large gap between head line and life line. • page 69 - INTROVERSION: swelled lower hypothenar (mount of moon) and dropping into the wrist. kiwihands wrote: Hmmm ... ... I just tallied up my scores for both sides and seem to come out as extrovert (total score of 2.2). Maybe I made a mistake - MBTI type tests all put me squarely into the introvert box, and that's also what my self-understanding is. Thanks for presenting your assessment. By the way, my study is focussed on the hands of high- and low scorers for Extraversion - which implicates that there is an intermediate (normal) group as well. Regarding the MBTI, one should be aware that by principle it does not identify any intermediate group - because every gets classified as an E or I. So, even while you always score an I... that does not exclude the possibility to that you might not belong to the low scorers on the Extraversion dimension in the Big Five model. By the way, have you ever shared your hands at this forum? PS. Sorry, without seeing an impression of your hands it would be quite impossible for me to help you find out whether you have managed to apply my quidelines correctly (but don\'t worry, I have planned to share many more details at a later stage). First of all, none of the extraverts in my sample have an Earth handshape. If that would have been the case I would have probably talked about a very broad hand... so, where I talk about a broad palm (relative to palm length & finger length) you can associate that with dimensions that are actually more typical for a fire hand shape (in the perspective of finger length to palm breadth) or air hand shape (in the perspective of palm breadth to palm length). But I can also inform you that I have not found any significant differences regarding finger length to palm length... and for this reason I would not recommend to associate my results directly with any of the 4 palm shapes. - 45% of the Extaverts have a Fire- or Fire(+Water) hand shape for at least one of their hands (compared to 14% of the Introverts). The description for point #8 says that you first (= first requirements) have to look at the location where the life line starts; the picture show that in the extravert-hand the life line starts in the upper half of the radial zone between the thumb and forefinger - while in the introvert-hand the life line starts in the lower half of that radial zone. And additionally you can look for whether the 2nd requirement is met as well. PS. All details & guidelines in the picture are important; but don\\\'t worry... I have planned to present more details at a later stage. tajender wrote: Very interesting dude Matrtijn. Life line and head line joined, Developed mount of moon are signs of extrovert. You always come with interesting funny items. Keep it up and enlighten all palmists. I have addressed Johnny's guideline in my former comment to Kiran. Regarding Holtzman's comment, page 41 in his second book describes how Holtzman theory is focussed on the balance between 2 aspects of the hypothenar in his theory regarding extraversion/introversion (via a consideration the balance 'life instinct' and the 'death instinct'). Holtzman describes that the 'death instinct' manifests (only) when the hypothenar enters the wrist, and he associates this specific part of the hypothenar with introversion only when this specific part is the dominant aspect of the hypothenar. And when the 'death instinct' does not manifest (= when the hypothenar is not entering the wrist), then he associates a well developed upper part of the hypothenar with extraversion. Regarding my sample, I can report that I have found no confirmation that the hypothenar enters the wrist more often in the hands of the introverts (quite a few introverts have this characteristics... but a likewise percentage of the extroverts has this characteristic as well). So, I think it is important to notice here that my results do not 'contradict' Holtzman's theory - because he is talking about the 'balance' between the upper- and lower part of the hypothenar... while my report only relates to the development of the full hypothenar.